10-Pack Provides Includes One of Each Color Variation. Color Therapy, or the use of colored light in healing the body is a concept that is over 1000 years old. 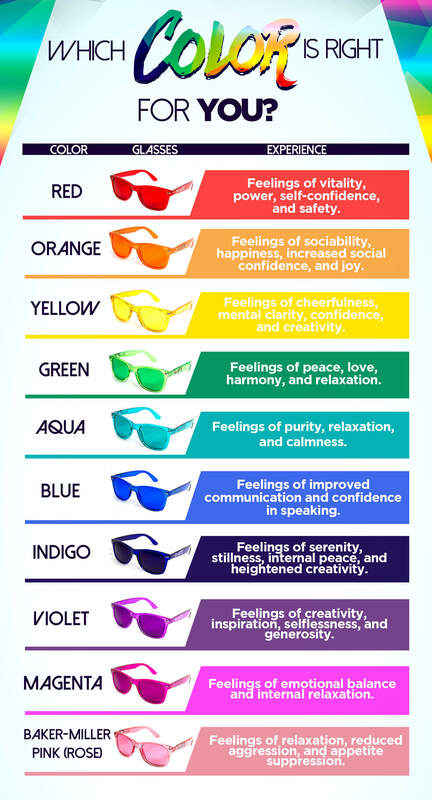 The idea is that our bodies ‘feed’ on certain colors of light within the visible spectrum of natural light, and that each of these Colors represents a certain function within the body. The 10-pack bundle provides you the ability to pair your glasses with your mood for the day. Whether you are stressed, need a creative jolt, or seeking feelings of peace, you’ll have the option of wearing the color that most suits your needs.